The pictures and rhymes would be a hit. My daughter loves frogs of all kinds. She would also love the charming illustrations! I think the rhymes would catch my sons attention. My son's grandpa's name is Gilbert so I think my son will get a kick out of this! My kids love frogs, so I know they would love this book. the style of illustration - they'd love it! I think my son would love it because my son loves frogs! I think my son will like that he needs to escape from becoming sausage. Definitely they'd like the gross idea of eating bugs. I think my child would like that its about frogs and eating bugs. My kids like animals -- they would like the fact he's a frog. I think our children will enjoy the humor! The illustrations are amazing! My kids would love it. The illustrations by Rose Cowles. 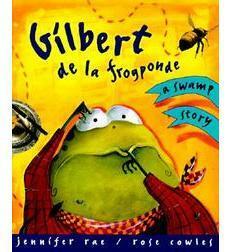 They would like Gilbert's wit as he trys to convince them, a book that makes you laugh is the best bedtime story. I read to my kids every night and they both love frogs!! My son likes frogs and I'm sure he would like this book.